Winning an award at a big fashion show like the Vancouver Fashion Week can be a daunting task. More so if you are little known at home, barely in your thirties and your siblings think you are nothing more than a tailor. By far, his claim to being known locally as a fashion designer was a small stint at the Bayimba International Festival 2010 where his collection came out as the best. This is Ras Kasozi’s road to international fame, and it started humbly. 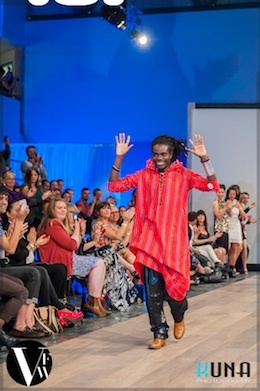 Ras Kasozi at Vancouver Fashion Week 2012. Photographer: Kuna Lu (Kuna Photography). His shoulder length dreadlocks and Kitenge pants somehow distinguish him from the office clad men at Top TV, our rendezvous place, and the minute I spot him, my instincts are on cue. “I picked interest in fashion and tailoring when I was 15-year-old, mainly because my mother was a tailor and she had her machine at home. Nevertheless, I had to use it illegally because her grand ambitions for me didn’t include tailoring,” Ras begins. More to oblige his mother, he did a university degree in Computer Science, but after looking around for jobs and failing to land any, he reverted to his original passion. “Bavubuka Dynasty is about celebrating talent and being African. It’s a lifestyle. In pursuing our talents, we don’t set our eyes on money, but rather on making an impact on the community. We have rappers like the young MC Flower as well as other artists,” he says. In a community of fellow artists, Kasozi realized the need to infuse art in his designs and also widen his focus: “I had a dream, a dream of changing the world through fashion. So I had to start thinking globally,” he adds. 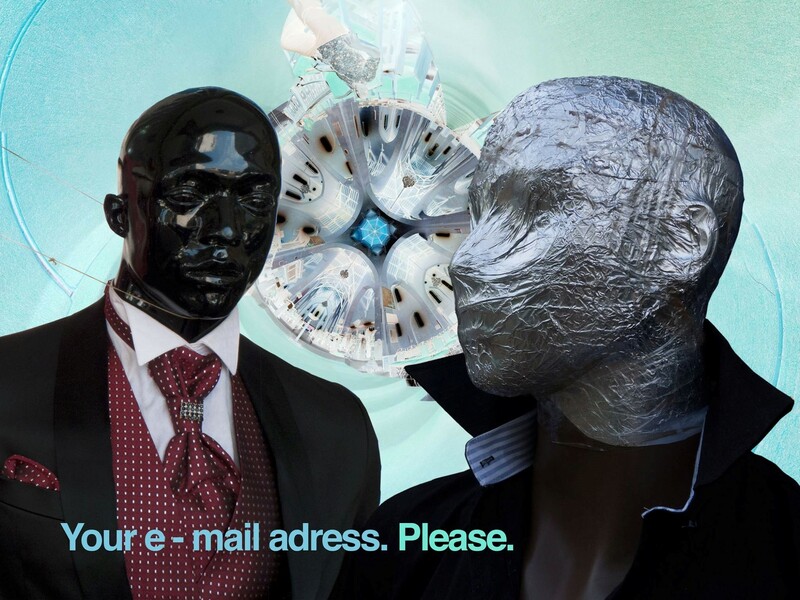 With eyes set on changing the world, the Internet became his ally in his ambitions. He created a Facebook page and a blog called KasWear as a platform to display his work. “Silas Balabyekkubo, the founder of the Luga-flow movement in Uganda, informed me one day that a fashion agency in Canada had called; The Five Agency had picked interest in my work and wanted me to be part of a fashion week that was five months away. He tried to get some people to help him, but soon he realized that they were poor at finishing, thereby he ended up doing everything by himself. Uppermost in his mind as he toiled away was to make a name for himself, and while people got to know him, he would dictate what they wore come 2013. Some of the major concerns when designing the pieces were how to extend African art into outer spaces while letting his identity shine through. And of course style and infusing art in design were also big issues. He had some jackets designed not for warmth but for style, and the same jacket could be rolled into a bag as well. He had been assigned only ten minutes to showcase four sections, which was casual, office, evening wear and glamour. However, it is confidence and believing in himself and God which he credits for his current success. 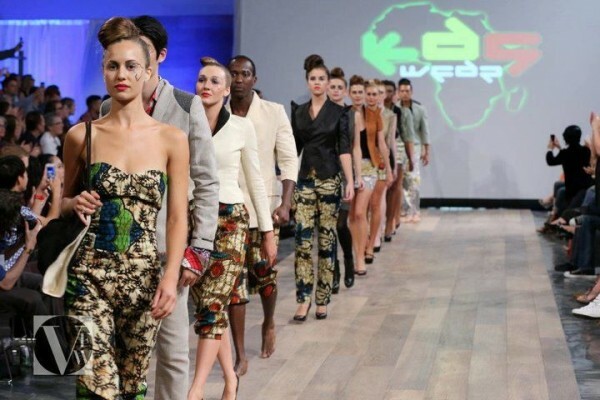 On the Ugandan fashion Industry, he says it’s growing but at the speed of a snail: “Comparing the talent here and in Canada, I would say we have a lot more to give. The problem is lack of motivation, vision and the ability to dream big. We also need to do something new each day about our art. Another issue is of course money. There is need to focus and enjoy what we are doing. It’s sweet when money chases you, instead of you chasing it,” he adds. Has winning the award had an impact on his career as a fashion designer? It definitely has, if one is to go by the amount of publicity and media buzz he has received. “Immediately after the show, I received text messages from Germany and New York. Africa TV and The Province, the most read newspaper in British Colombia, carried a story of me, as well as other media outlets,” he smiles in affirmation, but upon being asked how much money his award got him, he declines to mention the amount. Instead, he says that big doors now have opened up for him and is setting his sights high to New York and hopefully the New York Fashion Week. Kas Wear at Vancouver Fashion Week 2012. Photographer: Kuna Lu (Kuna Photography). All rights reserved. The one thing he admits to is that he managed to sell all of his runway collection in the hours after the show. For someone whose interest in fashion and tailoring was deemed illegal by his mother, he has come a long way. When I ask Ras Kasozi how his mother feels about him now, a slight shade comes over his face, before replying that his mother died two years ago and she never got to see how his love for fashion could catapult him to international fame. “I used to tell her that what I was doing was right, but it was hard to convince her. I participated in the Bayimba International Festival in 2010 as a fashion designer. My efforts were aimed at impressing her, my collection was about her, and it turned out to be the best at the festival. Unfortunately, she did not live to see it,” he says sorrowfully. By far, he says his family has not been supportive, except for one of his brothers who is slowly realizing the importance of his work. “In Uganda, people know about tailoring, not fashion,” he adds. Finally, we talk a little about his contemporaries in the fashion industry. Gloria Wavamunno is a supportive friend, as well as Anna Claire and Rafael. The Vancouver Fashion Week took place on 23rd September 2012. 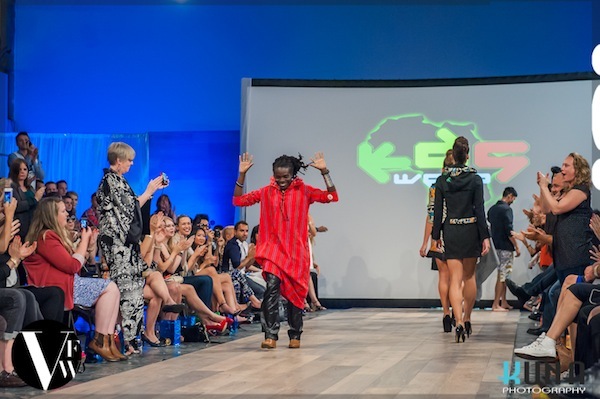 Ras Kasozi picked up the Fashion Week’s award for originality and creativity. There were 43 participating designers, Ras Kasozi the only one representing Africa! Great work. i love the fact that the designs fit on as well as off the cat walk unlike some of the cat walk designs that I have seen. Very inspiring story. Props for Ras Kasozi for his originality. Kas Wear will take over 2013!